Home to New Zealand’s top rated beach, the world’s most accessible active marine volcano, kiwifruit, glow worms, street art, and more, the region is aptly named the Bay of Plenty. It is filled with exciting and fun things to do in Tauranga (the largest city), Mount Maunganui (coastal beach town), and the surrounding region. It’s a locals playground, a weekend getaway for other New Zealanders, a key cruise port, and a haven for international visitors. Unlike cruise visitors, we had several days to explore. We included the Bay of Plenty in our recent North Island driving adventure and arrived after driving around the East Cape. We were ready for relaxation, but couldn’t resist the unique and fun things to do in Tauranga and the surrounding area. If you are arriving via cruise ship, be sure to see our recommended shore excursions below. 8 With so many fun things to do in Tauranga, Mt Maunganui, and the rest of the Bay of Plenty, which will you do first? 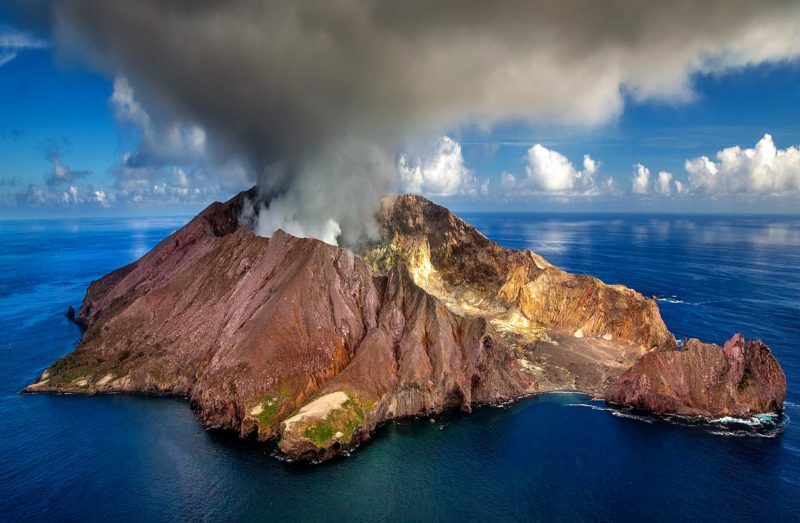 White Island is New Zealand’s (and possibly the world’s) most active marine volcano. Some compare the lunar landscape and active geothermal vents to their image of walking on the moon. The Māori name ‘Te Puia o Whakaari’ translates to ‘the dramatic volcano’. At 50 kilometres off the Bay of Plenty coast, White Island boat tours or White Island helicopter tours are popular and fill up early. Photo Credit: Julius Silver. Used with permission. Boat to White Island: Once at the island enjoy a guided tour of the inner crater including steam vents, bubbling mud pits, and a lake of steaming acid. Then observe the island’s walls from the boat, as well as wildlife viewing often including gannets, dolphins, and whales. Helicopter to White Island: Fly to and over White Island, explore the rugged coastline from the air while your pilot provides commentary. Then land and walk in the crater. 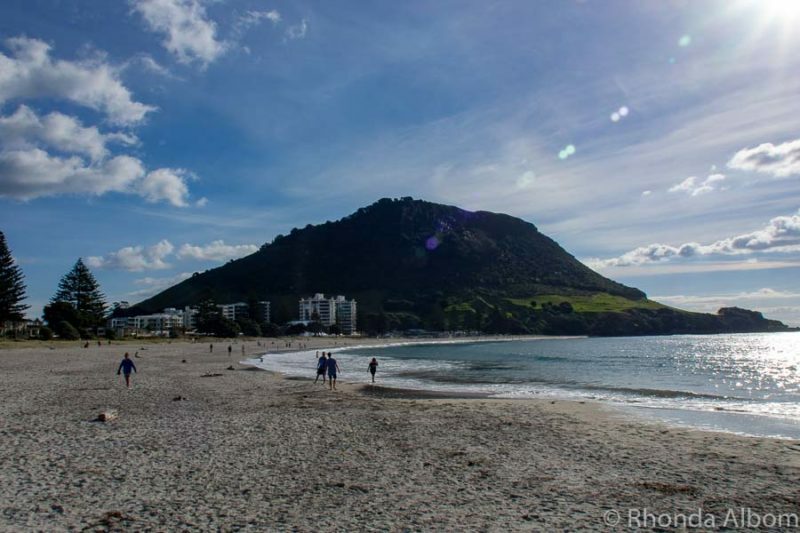 No question about it, Mount Maunganui Beach is paradise. Voted New Zealand’s number one beach, the seemingly endless white sand and surf are frequented by locals, Kiwi travellers, and visitors from around the world. It’s a popular surfing area, although the weather was calm when we visited. Also popular is snorkelling, and if you prefer to have a guide, check out this 2-hour guided snorkelling adventure. I am overlooking Mount Maunganui Beach to the south (towards Leisure Island) late on a cool autumn afternoon. A popular beach in the summer, it is included on Trip Advisor’s list of the world’s top 25 beaches. The extinct volcano’s Māori name is Mauao, which translates to “caught by the dawn.” Rising 230 metres above sea level, Mount Maunganui’s coastal views from the summit track are unforgettable. Due to a random turn of events, we didn’t make it to the top and had to turn back about midway up. To that point the walk was steadily uphill, but not too steep. 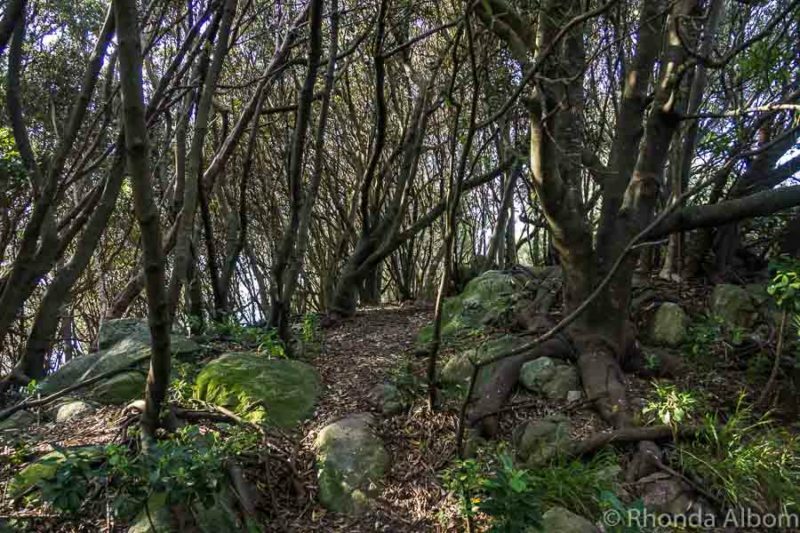 It’s a popular walk that is now labelled “the best” by one of the Game of Thrones stars. 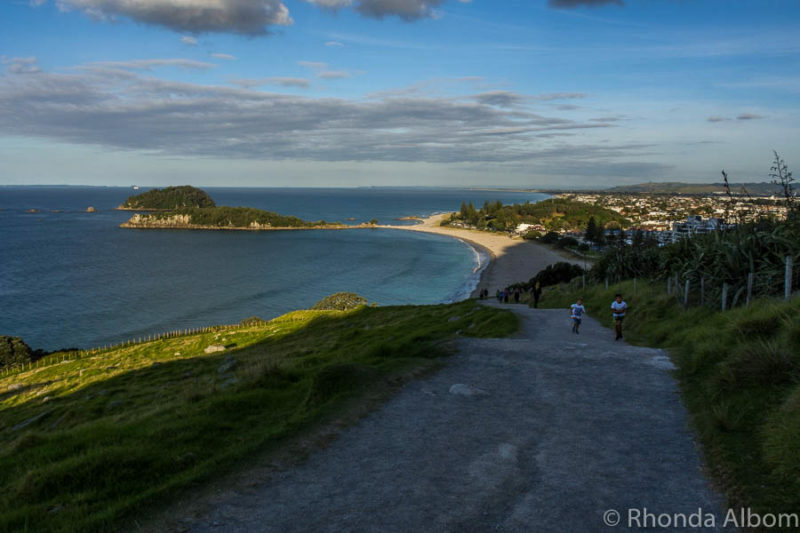 If climbing Mount Maunganui isn’t your thing, the more popular track is the 3.4-kilometre path around the volcano’s base. View from about halfway to the top of Mt. Maunganui. We can see Mount Maunganui beach, Leisure Island, Motuotau Island, and south to Papamoa Beach. Hiking path on Moturiki (Leisure Island). 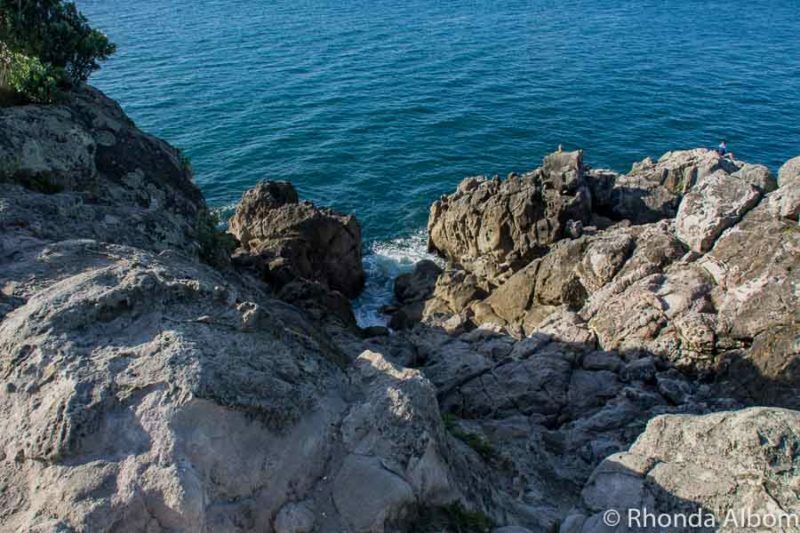 If the sea were rougher on the day we were there, the water spout would shoot up here. 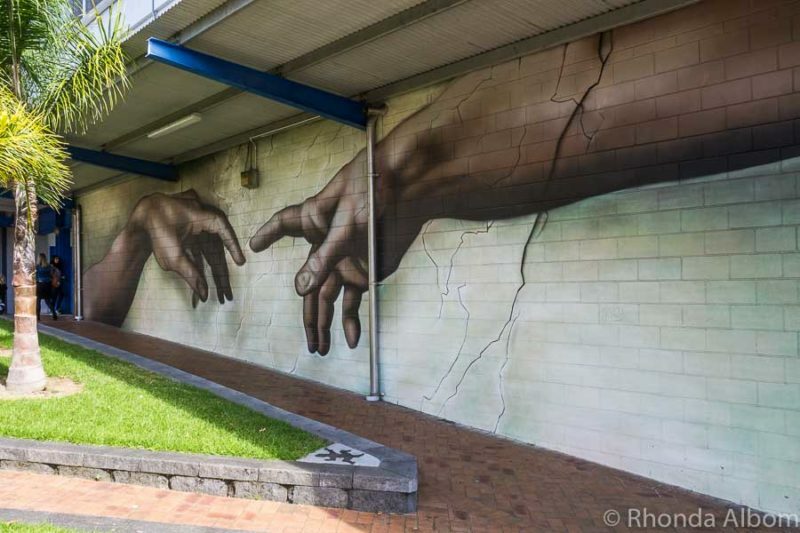 Just off the main street in town (Manganui Road), there is incredible street art, some of which is from well-known street artists like Askew One, Flox, or Andrew Steel. 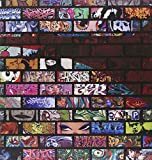 Ask at any i-site for a free street art map. “Huli.” This piece was created for Street Prints Mauao 2015 by street artist Hula. 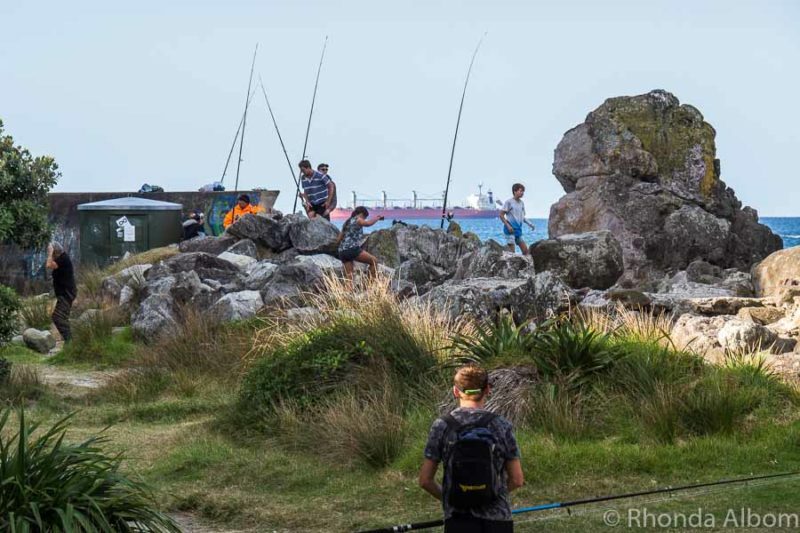 Locals are often seen fishing off the rocks, and if you have a rod, join in. The perfect place to relax and soak away the day. Or, if you are looking for things to do in Mount Maunganui with kids, there is a children’s pool with water slides. Less relaxing than a soak, but good family fun. Enjoying the sunset from Leisure Island. Tauranga is the largest city in the Bay of Plenty. Tauranga Harbour welcomes nearly a quarter million cruise ship visitors annually, and the port of Tauranga is now the largest cruise tour port destination in New Zealand, and consistently voted the favourite. (If you are arriving via cruise ship be sure to check out the excursions lower on the page. Tauranga has impressive street art. 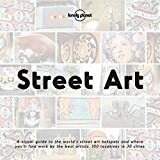 You can pick up a free street art map at any i-site. The two on the right are interactive. In the upper image, hubby and I are sitting on a seat and Cupid is shooting an arrow in our direction. In the lower one, I am standing in the space left between the wings. Do I look angelic? Tauranga Art Gallery is a regional art museum featuring a collection of historical and contemporary art in a modern building. It is open every day and admission is free. 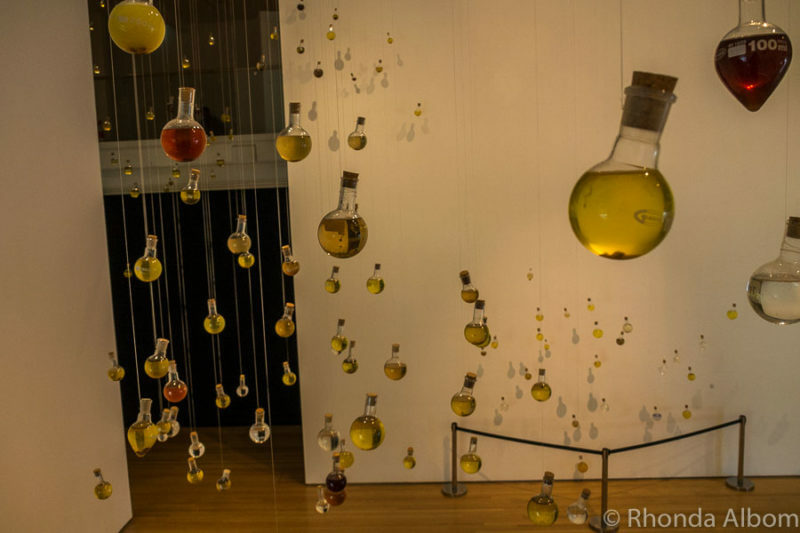 This exhibit is entitled “Whose Water Are You” by Swedish artist Jeanette Schäring. 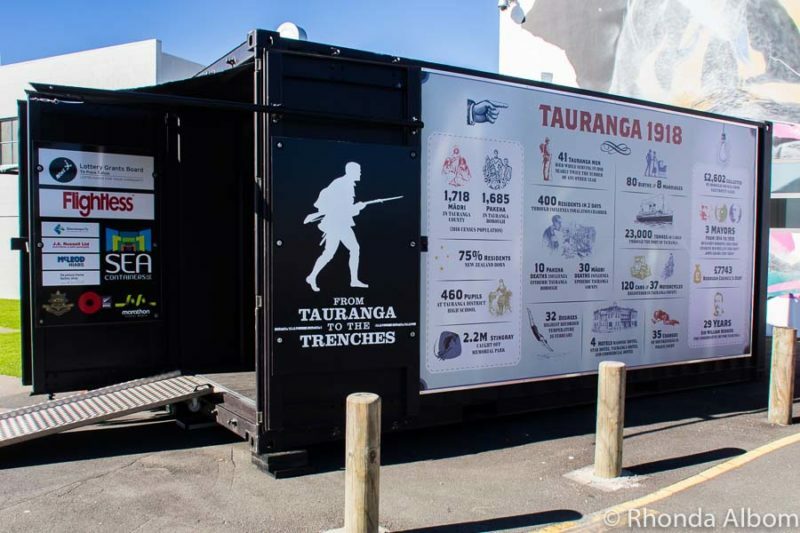 A small bit of history is hiding at the back of the carpark behind the Tauranga Art Gallery. The double container contains historical artefacts taking us back to 1918. 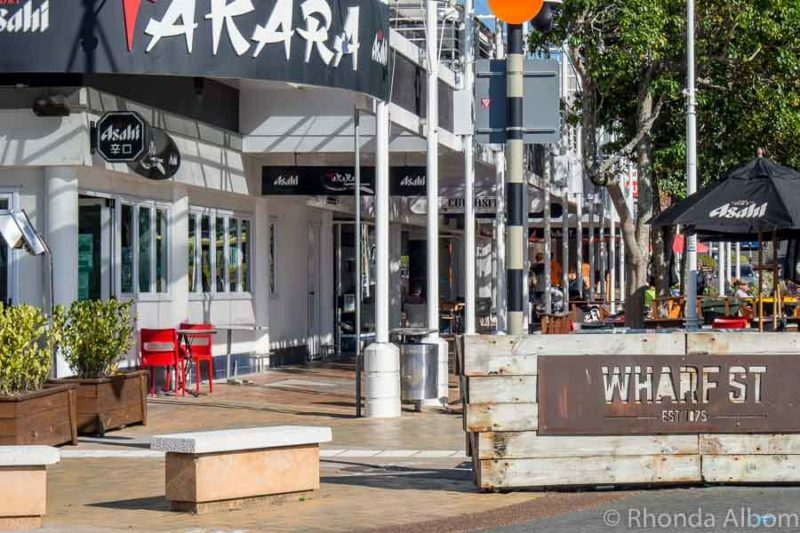 There are many great shopping or cafe choices along the modern Strand area of downtown Tauranga. Wharf Street in the Strand area of Tauranga. This five-hour boat trip offers an opportunity to view wild dolphins or to actually get into the water and swim with them. Award-winning guides keep both you and the animals safe. All necessary gear is included, but you will want to bring your camera. 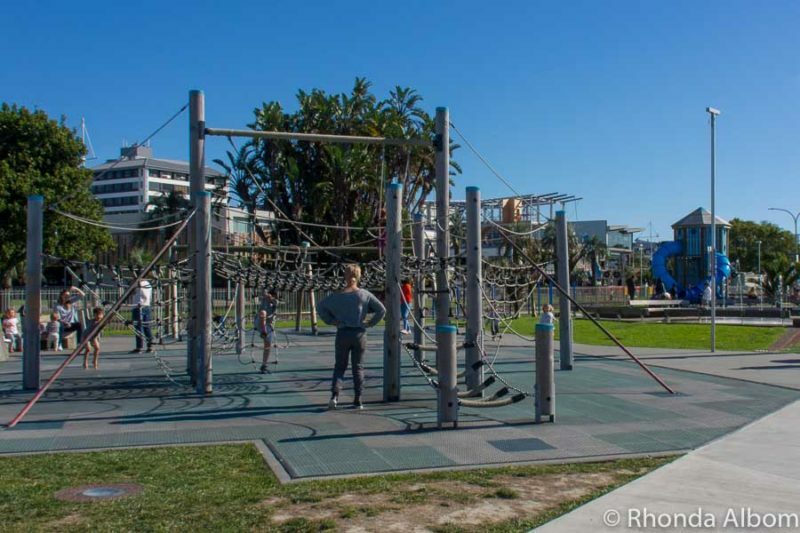 There are plenty of things to do in Tauranga with kids starting with this giant waterfront playground. With climbing structures, water play, and swings, this playground has it all. I wish playgrounds were this much fun when I was young. I think every person who grows up in New Zealand knows Hairy Maclary and his crew of five kooky canines. 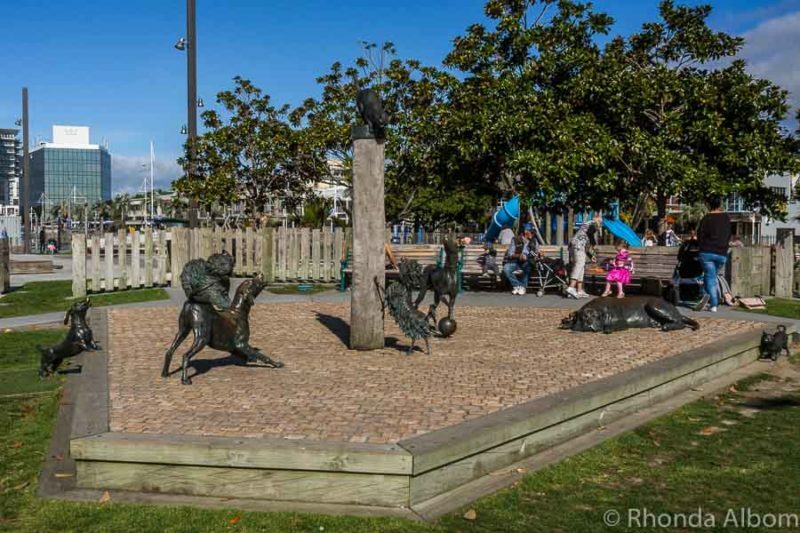 The Hairy Maclary series was written by Tauranga author Dame Lynley Dodd, so it should be no surprise the town honoured her and her “crew” with these bronze Hairy Maclary sculptures. They are located at the waterfront, at the edge of the playground, and can be discovered on the Downtown Tauranga Art Lover’s Walk map available for free from the information site in town. Hairy MacClary fans will recognise this immediately. The Tauranga water park is a summer activity that was closed for the season when we visited in autumn. 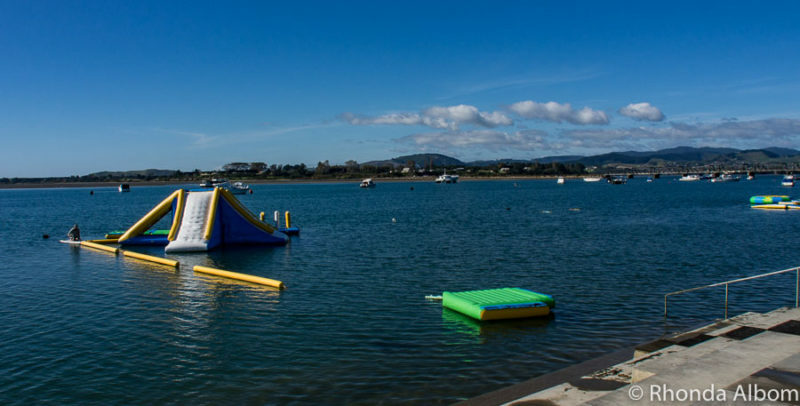 Claiming to be New Zealand’s largest floating waterpark, it tops my summer list of fun things to do in Tauranga with kids. Closed for the season, only a few pieces of the water park still remain. Aside from the adrenaline pumping white island visit, there are a few other fun things to do near Tauranga. We loved our kiwifruit plantation tour. Allow a bit of extra time to visit the cafe after the tour for samples and then get a scoop of kiwifruit ice cream. 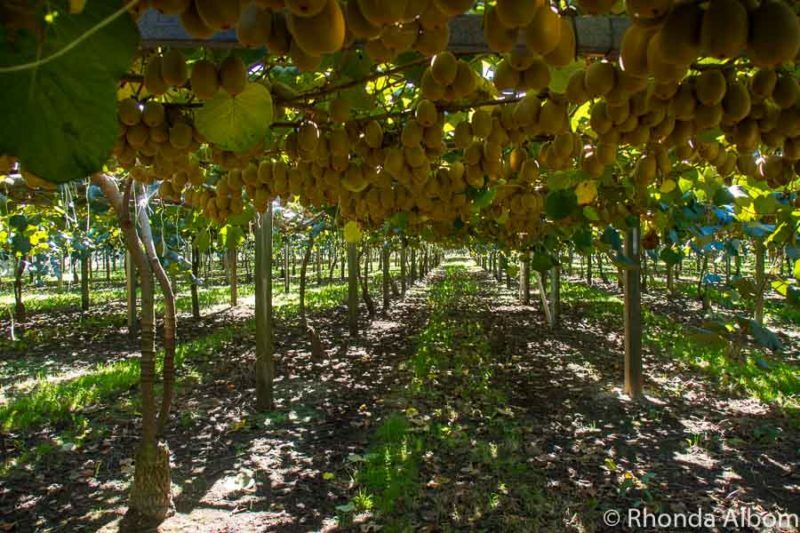 Golden kiwifruit ready to be picked. The thrill of night kayaking and the magic of glow worms made our kayak tour a truly memorable event. 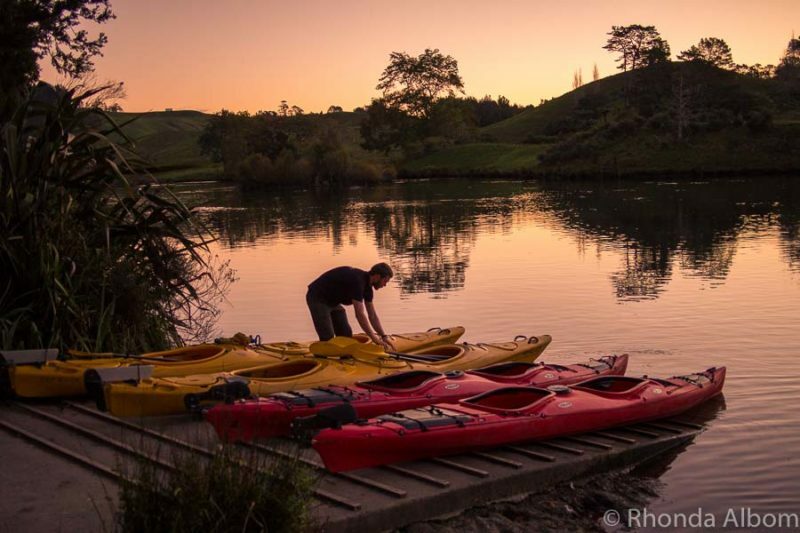 The kayaks were set up for the Waimarino Kayak Glow Worm Tour while we (participants) enjoyed wine, cheese, and the sunset. 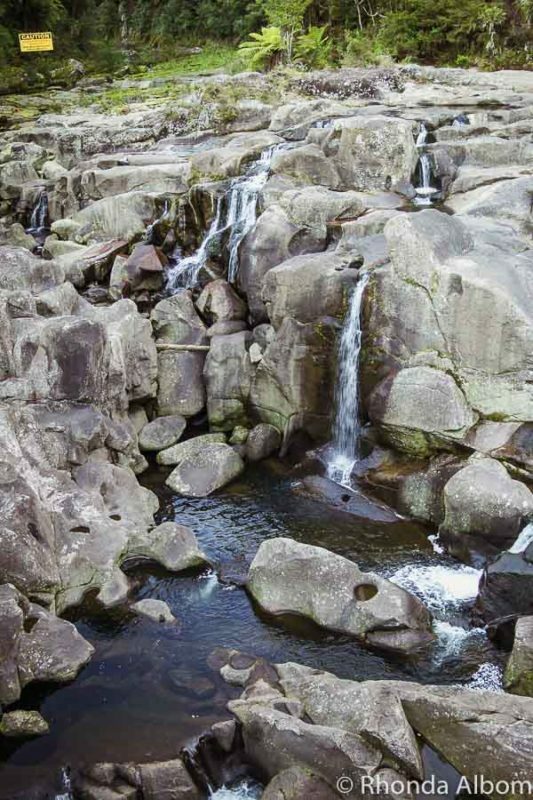 McClaren Park is 190 hectares of parkland best known for Lake McLaren, the McClaren waterfall track, and the glow worms that are plentiful after dark. Our kayak tour was in this park. McLaren Falls had a very low flow of water when we visited. Photo Used with written permission from Hobbiton Movie Set. 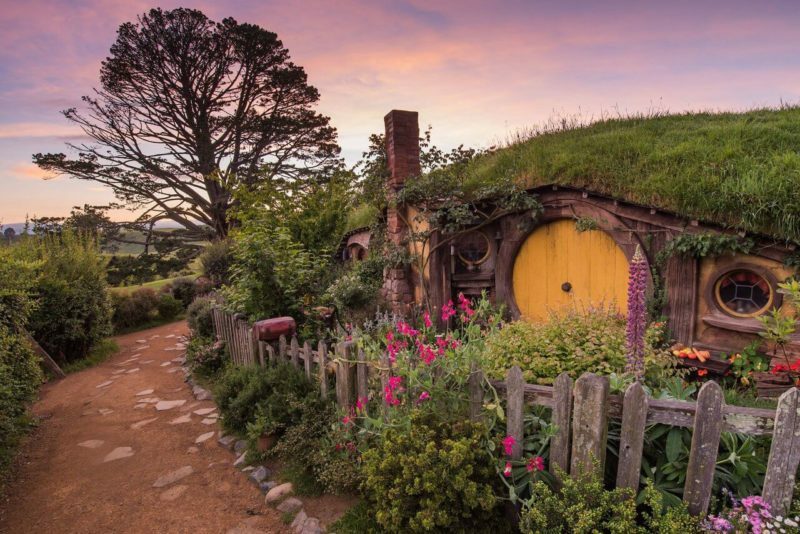 If you’re a Lord of the Rings fan and not travelling in your own vehicle, a tour from Tauranga to Hobbiton will be the easiest way to explore the Shire. If you have a vehicle and are happy to drive yourself to Matamata (45-minute drive from Tauranga) you may want to purchase your Hobbiton tickets in advance. Nothing worse than arriving to find out they are sold out for the day. If you haven’t included Rotorua as a destination on your travels to New Zealand, then you may want to take a tour to this geothermal region. If you are arriving via the Tauranga cruise terminal, you will have limited time to see the highlights of the region. While cruise ships offer plenty of Tauranga shore excursions, we generally find independent tours to have smaller groups with considerably lower prices to see the identical venues. Many companies, like Viator, even offer a worry-free shore excursion guarantee (be sure to read the details, and verify that the tour you selected currently provides the guarantee). If you are NOT arriving via ship and your plans are flexible, you might want to check the port of Tauranga cruise ship schedule. As you can imagine, in a regional area with a population of less than 140K, having multiple cruise ships in port on the same day makes many of the popular venues crowded. Check here for cruise ship schedules. We had our own vehicle and opted to stay at the Papamoa Beach Resort (see our full review at Papamoa Beach Resort: the Perfect Stay in Bay of Plenty New Zealand). Our beachfront villa was a perfect choice. Sleeping in a comfortable bed and starting each day watching the sunrise over the beach, I was in a great mood all day. 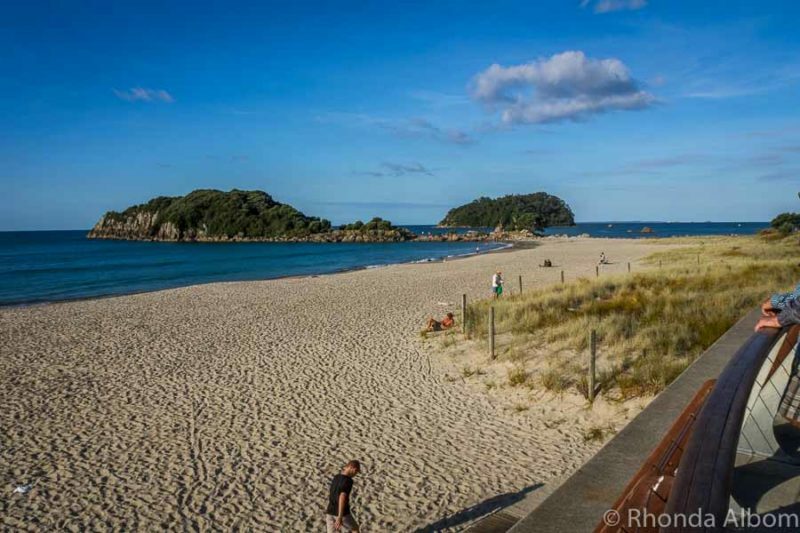 Papamoa is only a short drive to either Mount Maunganui or Tauranga city, but more importantly, it’s a beach destination on its own, and most of the places we visited were outside of either of the two cities. If you prefer to be right in all the action, you might want to check out these Mount Maunganui Accommodations. Here you will find everything from luxury five star high rise accommodations or apartments to shared rooms at a backpackers. The third primary option is Tauranga accommodations offering nearly as many options as Mount Maunganui, but often at slightly lower prices. 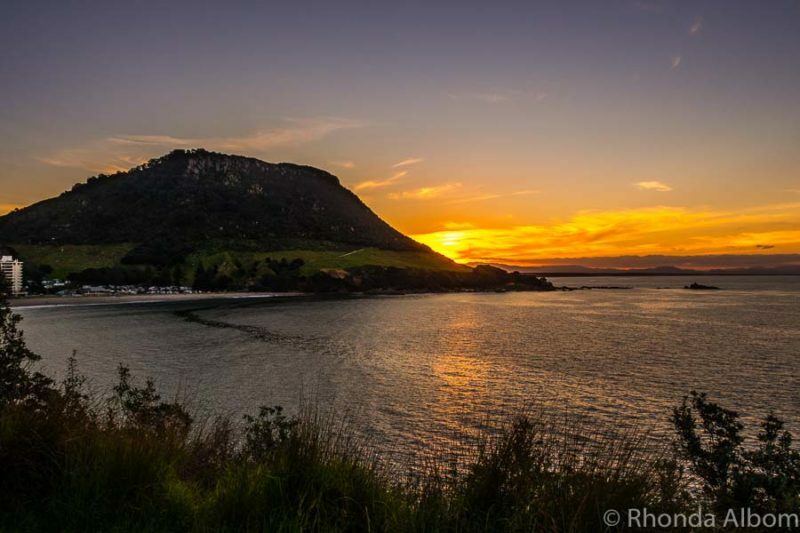 With so many fun things to do in Tauranga, Mt Maunganui, and the rest of the Bay of Plenty, which will you do first? Disclaimer: We worked with Tourism Bay of Plenty. Also, we were provided with many complimentary entrances, tours, sample items, or media rates to assist in the writing of this review. The opinions expressed here are strictly our own. Sign me up for snorkeling and the night kayak to glo worms please! It all looks super beautiful and very much like things we would love to explore as a family. Thank you for sharing with #FarawayFiles, cheers from Copenhagen. I haven’t spent enough time in the Bay of Plenty. I am just glad it’s not too far and I can go back some day. My only trip to NZ was a quick one, and I didn’t get to the Bay of Plenty. After reading your post, I will next time. I’m a big street art fan, and I’d love to see the glow worms. There is so much to see in our tiny country, and few people allocate enough time to see it all. LOL – I have been here 16 years and am still making new discoveries. With all the volcanos erupting all over the world, I love the idea of doing this White Island Volcano tour. However, clearly there is a lot to do in this area. Definitely a bucket list destination! LOL – with all the volcanos erupting all over the world, the idea of White Island makes me nervous. Sounds like an amazing place to visit and amazing photos by the way, How I wish I can capture picture as good as yours! Ok – LOVE Hairy Maclary!!!! I haven’t heard that name in so long, and I just got really nostalgic as I used to read those books to my girls all the time. I don’t think I knew the author was from New Zealand! I’m going to have to dig them up. 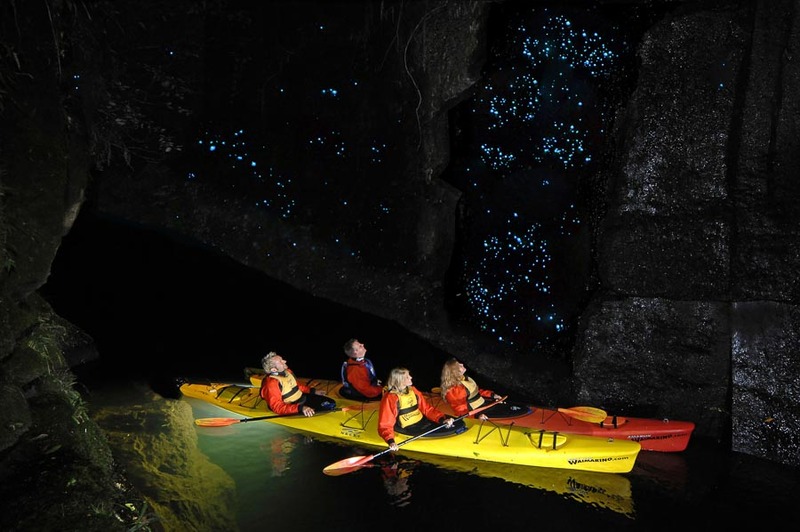 The Bay of Plenty sounds heavenly – night kayaking with glow worms? Sign me up. Wow! What a great area. All of the beaches look so calming. Plus there’s art and coffee. Can’t wait to read about your glow worm kayaking trip. Wow! Gorgeous and fascinating place! Loved your beautiful photos…seeing the kiwifruit growing was fun. Bay of Plenty indeed! There looks like there are sooo many cool things to do and it’s so beautiful! Definitely pinned this! I’ve only been up the mount once and it nearly killed me lol. Other than that yes there is plenty to do here. I had no idea a live volcano could be such a tourist attraction! It’s beautiful! And it is so different from the volcano Hawaii is experiencing, which is awful! The closest I’ve been to a volcano was Mount St. Helen’s in Washington State. I actually heard the explosion from my home just north of the international border. Your first photo is, I think, my favourite. I’m pretty sure I’ll never get to New Zealand now, and I’m rather sorry now that I know there’s so much to see and do. My husband would enjoy all of it, and I’d enjoy sitting on a beautiful beach, under a big umbrella, watching the sea. In love with all the photos — especially the sunset and volcano! New Zealand has been on my list for a long long time, and after reading your post about Tauranga, I definitely need to visit soon! I know I would never run out of things to photograph here! Wow! If your narrative wasn’t enough, the photos pushed it way to the top of the bucket list. Love the sound of this place and so agree about cruises (I love them, don’t get me wrong, but. . .you can see so much spending even a couple of days somewhere!). Great post. Once again you have wowed with the fabulous places you visit! But…I would probably spend all my time at the beach looking for seaglass! The Bay of Plenty is definitely an apt name. Kayaking with glow worms sounds particularly appealing but I would also would love enjoying the beautiful beach. WOW. This place has it all?!? From those natural wonders (glow worms?!?! Yes please) to even the street art. I would love to go to New Zealand some day and the Bay of Plenty sounds like a good place to start!! Wow that volcano tour sounds amazing! It does look so dramatic! I’m completely unfamiliar with New Zealand so I enjoyed reading this a lot! The beach looks so beautiful, and quite remote too. Does it get busy during summer? 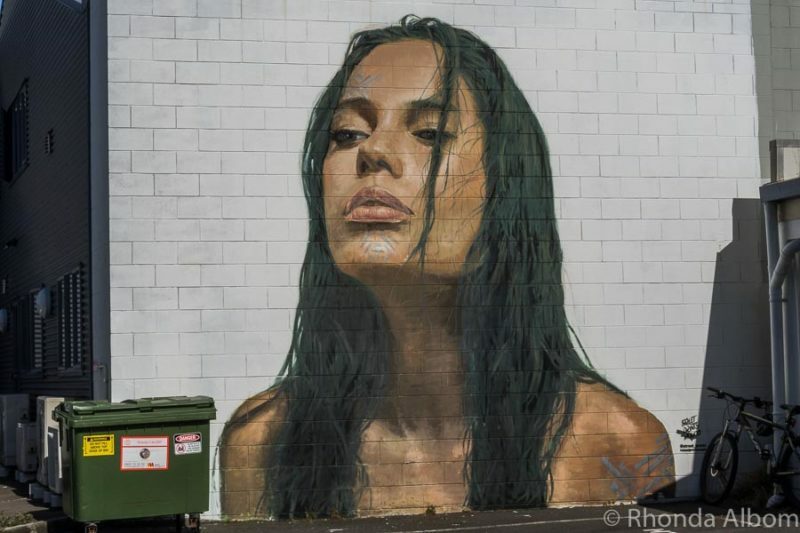 I also love the art work around Tauranga, especially the mural of the woman, just stunning. I’d also want to take many photos of the volcano and the sunset, it looks spectacular! I feel so uninformed, I actually had no idea it was volcanoes there. The second picture looks so cool and unreal. Tauranga looks like a place for everyone, families, kids and youth. I would love to see the street art. The nature seems breathtaking and it is good to have activities to do if it rains like checking out the art galleries :D. Thank you so much for sharing. So much to see and do in Tauranga! There are so many things from your list that I would absolutely love – like the White Island volcano tour (the helicopter tour must offer stunning views), visiting the Kiwi plantations and the night kayaking to see the Glow Worms (never knew there were such tours)! Looking forward to reading your detailed post on the glow worm trip. Tauranga was unknown to me till now! I am glad to have discovered it through your eyes! It sounds so much fun and full of activities and excursions! Tauranga and Mt Maunganui are both great destinations. You make the Bay of Plenty sound like such an exciting place to visit, Rhonda. 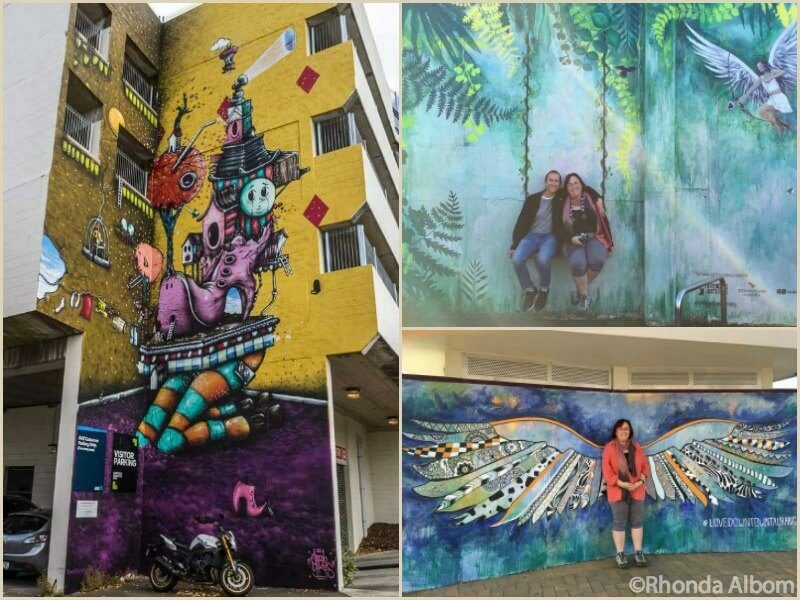 I’d love to visit this region of New Zealand and see an active marine volcano (not from too close, though), eat kiwifruit and admire some street art in Tauranga. Mount Maunganui Beach looks wonderful too. I’m hoping to come visit these places someday too. White Island is one of New Zealand’s highlights, and being only a few hours from Auckland, it is easy to get to the Bay of Plenty. WoW! I think I need to visit! WAIT. A glow worm is actually a thing!? I LOVE THAT. These pictures are absolutely beautiful, especially the one of the sunset. I’d love to visit Tauranga, but the flight seems SO long to get there. I wonder how long I would actually want to spend in the region to justify the (very, very) long flight. There just seems to be so much natural beauty and so much to experience! Yes, glow worms are a thing, and it is their bottom that glows. As for travel, we have a rule in our family, a minimum of one day for every hour of travel – so we try not to go to the states for less than 3 weeks, Europe for at least 7 weeks, etc. Absolutely beautiful. I would play in that water park. The Blow Hole reminds me of the Devil’s Punchbowl in Oregon. Yes, I have seen photos of it with wilder seas, and it did look like Devil’s Punchbowl. This all sounds so amazing! Visiting New Zealand has always been a dream of mine. 2 of my best friends lived there for a year and it just looks like such a beautiful place. New Zealand is so beautiful. We came 16 years ago and are still here. Incredible fun things possible there. 🙂 Love the wall art. The Kiwi garden looks great. Kiwi plucking should be fun. 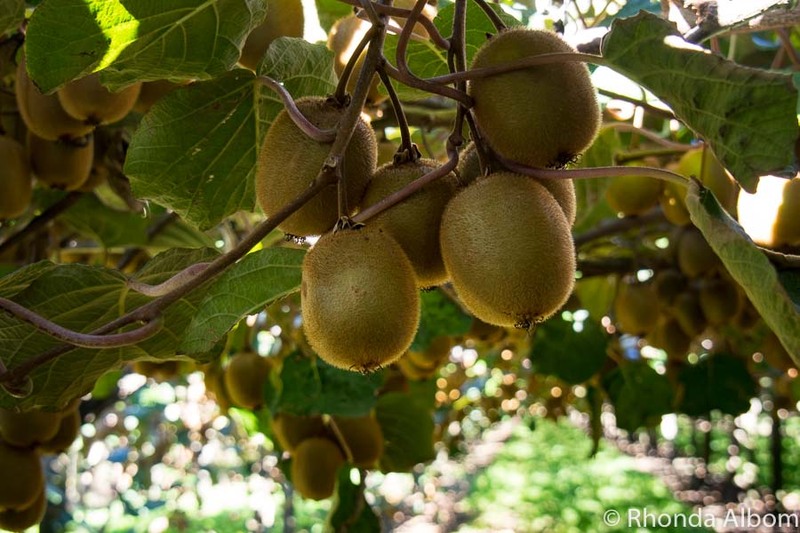 If you really think picking Kiwifruit would be fun, you can apply for a 10-week job picking fruit job, complete with a working visa and a chance to see New Zealand. I’m exhausted just seeing all the things that are available. What a fun area. LOL – there is the beach for relaxation, so you don’t have to be exhausted. Tauranga is a very popular New Zealand cruise port. There is so much street art in the two cities. Amazing and huge collections. Breathtaking scenery! BTW… how did it get the name “White Island”? Thanks for the research and for the beautiful post! The first thing I’m going to do is to take a plunge in the hot salt water pools! How many days do you think I need to do all those fun things in Tauranga? And also, how much should I prepare? To do it all, probably a week, but it really depends how long you want to spend relaxing on the beach. You got my attention with Hobbiton! That I’d like to see. I’d also explore that offshore volcano. By boat of course. Hobbiton is one place I haven’t been yet. Maybe one day. The street art really is fantastic. I have tons of photos of it and may do a post just about the art. That looks like a place where you’d have to be dead to be bored. So much to see and do! I’ love to walk the beach or see the volcano, and I know I’d love McClaren Park and Falls. I have never seen such lush kiwi plants before as those in your photo of the kiwi farm. LOL – although it is true, there is plenty to do, something for everyone. As for the Kiwifruit – check out my full review of the Kiwifruit Country for loads more photos. Thanks Fi, we really enjoyed our visit. Great, sharp photos! Beautiful scenery! The street art looks really beautiful and unique. 🙂 If I have the opportunity to go to New Zealand again, I would love to swim with the dolphins! That sounds like an incredible once-in-a-lifetime experience! If I get back to Bay of Plenty in the summer, I would love to swim with dolphins too. Very cool photos! I especially like the one of you and hubby in the swing. Neat list Rhonda. We never made it to Tauranga but did spend a day in Rotorua as we flew to the South Island. This region of NZ does rock; from the people, to the culture to the natural beauty, you have a winner. Heck, all of NZ is a winner. I am going to miss this place in a few weeks but also know Kelli and I will be back…sooner than later, hopefully. I know you didn’t get to Tauranga, but you were living in the Eastern Bay of Plenty when you were in Opotiki, so you know first hand how beautiful the region is.